Most iTunes users know that roughly once per week, Apple offers a few new freebies: music, TV shows, video clips, and even the occasional audiobook. Of course, short of loading iTunes every day and poking around various areas of the Store, there's no easy way to find the free stuff. Actually, if you start iTunes, head to the Store, and scroll down a bit, you'll find a "Free on iTunes" section. But I find this a bit confusing, as it lumps everything together. Plus, you still have to run iTunes to access it. 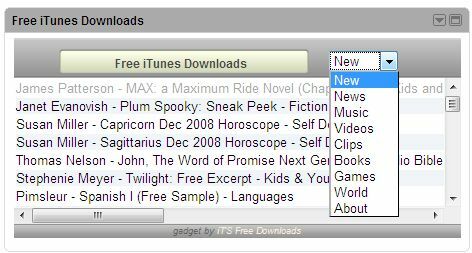 If you're an iGoogle user, add the Free iTunes Downloads gadget for instant updates on the latest free stuff. The Free iTunes Downloads blog This blog posts full descriptions of each and every iTunes freebie, and it's updated as new items become available. Great choice to add to your RSS feed reader. Get Free iTunes Store Downloads For those who want just the links without lengthy descriptions, this site organizes the downloads by category: songs, TV shows, short videos, etc. Free iTunes Downloads gadget A must-have for iGoogle users, this home-page gadget lists all the latest freebies. Even better, you can sort them by category: new stuff, music, videos, and so on. Have you found a better way to keep tabs on iTunes freebies? Leave a comment below and tell me all about it.